Dinafem - Blue Hash. Free US delivery. Blue Hash cannabis is an Indica-dominant cannabis strain obtained by crossing a California Hash Plant with a Blueberry. The result is a balanced hybrid that allows growers living in cold mountain areas to obtain quality crops. 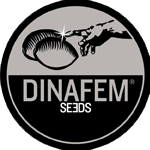 This cannabis seed is the best option for any grower looking for a plant that withstands tough, cold or humid climatic conditions and that produces fast, abundant, high-quality yields.